Posted on Monday, December 26th, 2016 at 7:11 pm. SATURDAY (12.31.16) – Open until 2am & accepting reservations for parties of ALL sizes! Join us NYE for Aprés Ski cocktails from 4-6pm, and again after dinner until 2am! Posted on Thursday, December 22nd, 2016 at 8:46 pm. This holiday season we will continue to be open our regular Thursday through Sunday evenings for dinner from 5:30-9pm, with the addition of dinner services on December 27th and 28th. Reservations for parties of 5+ only. Happy Holidays! Posted on Wednesday, December 14th, 2016 at 6:32 pm. What you know ’bout squid ink pasta? Posted on Thursday, December 8th, 2016 at 11:46 pm. Posted on Thursday, December 8th, 2016 at 10:45 pm. The river burbling from Lake Rescue runs south toward Okemo Mountain Resort, then arcs behind Ludlow’s Main Street. On the edge of that river stands a hostel, though you might not be able to tell from the outside. The pale yellow Victorian with deep-green shutters looks more like someone’s family home or a classic Vermont bed-and-breakfast than it does like a budget sleeping stop. While hostels vary across the world, all build on the same basic model: travelers sharing low-cost housing. “Housing” typically means a bunk with clean sheets in a dormitory-style room plus free breakfast — which could be a full spread and coffee or a package of Weetabix and warm orange juice. Always integral to the hostel format, however, is the sense that you could not be anywhere but here — whether “here” is the side of a mountain in South America, the backstreet dregs of Prague or the banks of a shallow river in Ludlow. 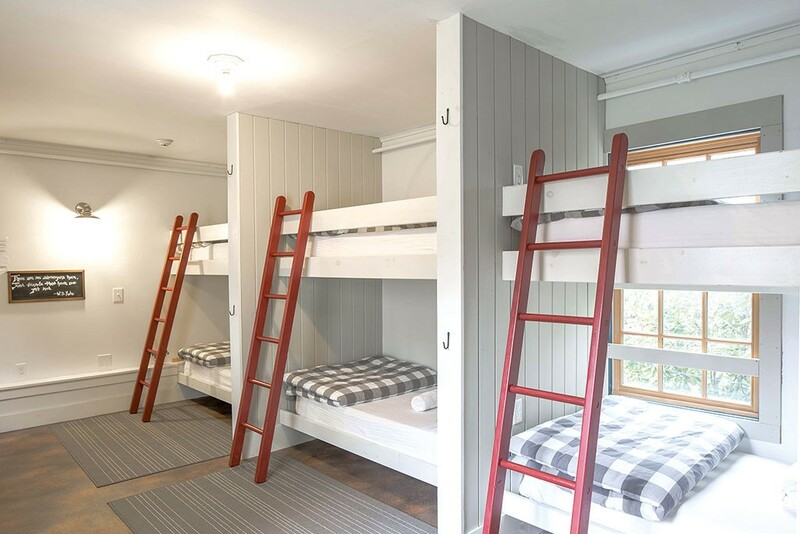 Homestyle Hostel, at the latter spot, embodies that ideal of affordable lodging with an intimate connection to its setting. 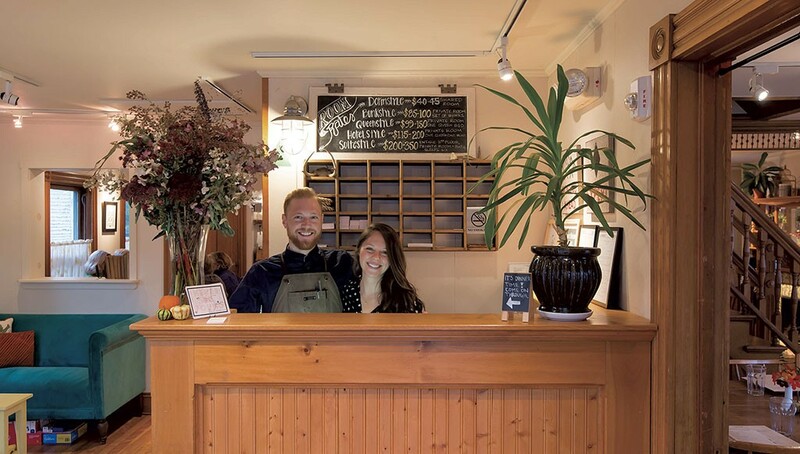 Yet co-owners Eliza Greene and Justin Hyjek, working with seasoned chef Alyssa Prouty, go well beyond satisfying the elemental human needs for food, drink and shelter. The wraparound porch of the three-story home is dotted with Adirondack lounge chairs, potted flowers and patio tables painted seafoam green. Inside, along with a variety of accommodations, travelers will find a farm-to-table restaurant and an elaborate bar program with a craft cocktail menu that holds its own among the state’s best. There’s also a list of hard-to-find brews and wines and a selection of espresso drinks for any caffeine-craving patrons. Hostels, with their dorm-like setup, tend to appeal to a younger clientele, but Homestyle’s housing runs the gamut: Besides two six-bunk dormitories, it offers three private rooms and one six-person suite finished with a leather couch, a flat-screen television and board games tucked under the coffee table. The gist: Backpackers are welcome here, but so are guests seeking creature comforts. When Homestyle opened in December 2014, Greene and Hyjek had plans for an extensive bar but none for an in-house restaurant. The pair met nine years ago in Ludlow, connected by mutual friends after their freshman year of college. Greene was a Chester local; Hyjek, 29, was born and raised minutes from the hostel he now co-owns and operates. Shortly after they started dating, the two traveled through South America, trading labor at local hostels for room and board. “We’d do reception, kitchen work, bar work, cleaning, anything,” says Greene. She and Hyjek returned to Ludlow inspired to bring the communal ethos of hostel living to Vermont. When they found the spot at 119 Main Street, it had been on the market for two years. The skeleton of the place was in good condition, having been renovated after a hard hit from Tropical Storm Irene. Here, Hyjek recalls thinking they could expand on the bare-bones hostel structure to welcome patrons across a wider spectrum of wants and needs. 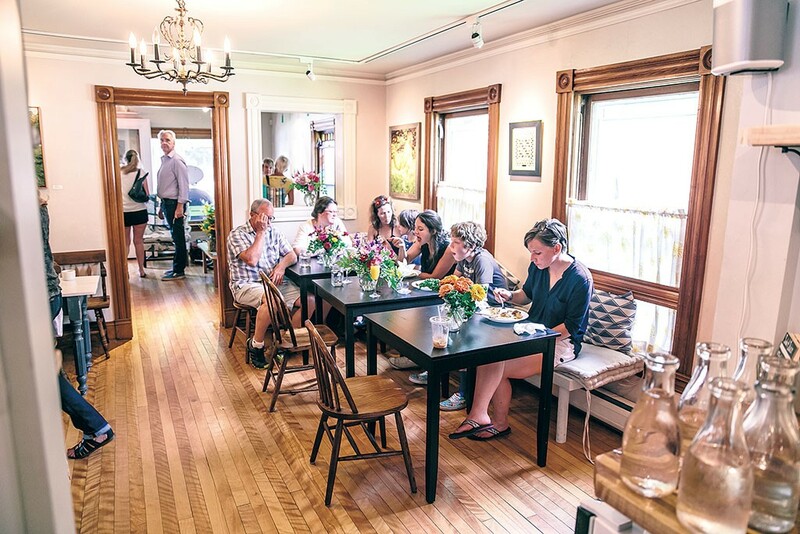 Homestyle’s clientele does tend to fall on the younger side — not typical of Ludlow itself, where the average age is 44. But alongside the millennials headed to nearby hubs such as Okemo Mountain Resort, one might find older couples craving a luxurious meal or families seeking affordable lodging. That restaurant is an unexpected hit. Months after Homestyle opened — complete with contemporary hostel housing and nascent bar plans — a local chef asked to rent the kitchen for a few pop-up cooking gigs. “The dinners took off,” Greene recalls. “Food and drink became half of our revenue, and we were shocked at how quickly it happened.” After a year, their pop-up cook left the state to explore non culinary ventures, but, among locals, the high expectations for Homestyle’s food and drink stuck. Greene and Hyjek needed a chef. Enter Prouty, who spent six years as sous-chef at Ludlow’s acclaimed restaurant the Downtown Grocery. 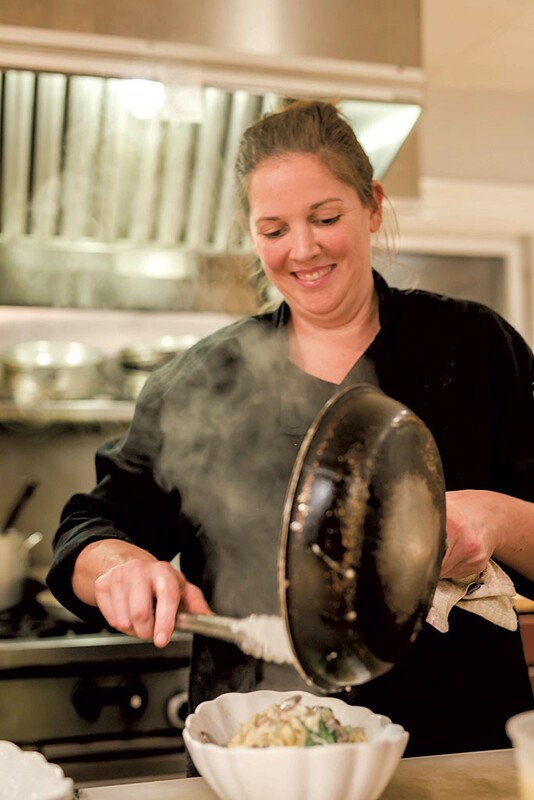 Prouty became Homestyle’s head chef in January 2016, and the menu reflects her creative freedom in the hostel’s kitchen. So does the setup. The open kitchen — with hardwood floors and countertops and a six-burner stovetop — looks more like Mom’s house than the realm of chefs and line cooks. There are no ticket fires shouted across a hot line, because there’s no line, no coursing and no expediting. Food is served family-style and comes out when it’s ready. On a recent Saturday evening, the bar and restaurant at Homestyle are almost full by six o’clock. Hyjek greets regulars at the bar as he pours a line of cocktails into coupe glasses. One patron is drinking a scarlet blend called the Deadbeet: Espolón tequila, a housemade beet-and-jalapeño shrub, Bittermens Hellfire Habanero Shrub, Cointreau and a hit of lime. Her date sips an intensely orange mix of Barr Hill Gin, Byrrh, spiced burnt-orange syrup, fresh cantaloupe, lemon and salt. The bartop holds three cans of Pabst Blue Ribbon, a bottle of Australian viognier, a double IPA draft from Burlington Beer, two cans of Tecate beer, two verdant cocktails, a Boylan Bottling black-cherry soda and lots of elbows. At a corner table by the kitchen, a family of five is just receiving dinner from a server. The kids have ordered housemade spaghettini and meatballs; the parents, Northeast Family Farms flank steak over smashed garlic potatoes with watercress and braising jus. Hostel diners have plenty of starter options, too, such as the rocket salad — spicy greens tangled with roasted sweet potatoes, radishes, beets, candied walnuts, sherry vinegar and creamy knobs of blue from Plymouth Artisan Cheese. A dish of Brussels sprouts is decadent yet simple. The bulbs are caramelized mahogany brown on the outside and laced on the creamy inside with honey, balsamic vinegar and a handful of roasted almonds. 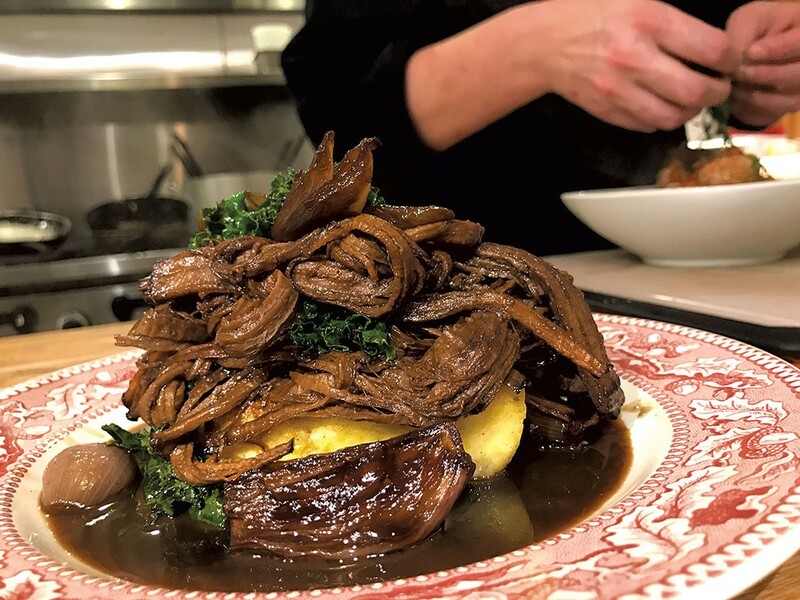 Polenta cake comes with a pile of kale, whole roasted shallots and Black Watch Farms braised brisket nestled in its own fragrant juices. The flaky crust on chicken pot pie permeates all the nearby tables with the smell of butter. For dessert, guests can try a scoop of homemade cookies-and-cream ice cream or a fudge brownie sundae that is, happily, too dark with cocoa to be overly sweet. Then there’s the vanilla crème brûlée, a must-order when available. The sugar is flamed into bittersweet glass over custard bright with orange-yellow yolks and barely sweetened with vanilla bean. The crowd chattering in the dining room is a mix that exemplifies the hostel’s come-one-come-all attitude. Seated at the tables are older couples, families, romantic-looking dating pairs and a group of friends drinking local beer over small plates. A baby hangs out amiably in his high chair before deciding he’d rather snuggle with his mother in her high-backed seat at the end of the table. There are cloth napkins, a flickering fireplace, wooden tabletops, candles, wraparound benches, a scattering of armchairs and a smell of warm onions seeping in from the open kitchen. Posted on Thursday, December 8th, 2016 at 6:31 pm.